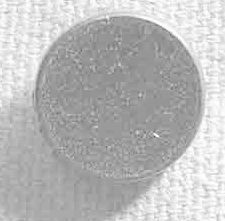 The smaller Enlisted button is 156 S. It is 9/16″in size and has a regular shank. 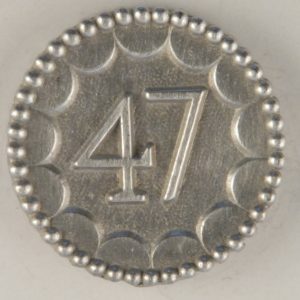 the 47 is in the Center of the button with a decorative edge. Price: 1 to 12 @ .55 each, 13 to 144 @ .48 each and over a gross .47 each. 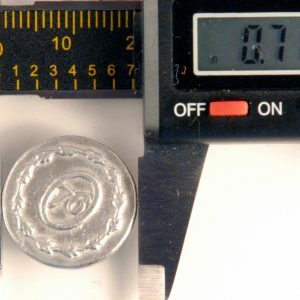 Matching button is 154 L and long shank 156 L Long. 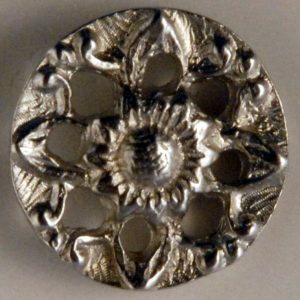 This is a fine example of a floral design with a tooth edge to set it off. It is a Rose nestled in a swirl of leaves. It would be best in the Civil War era or even with modern clothing. 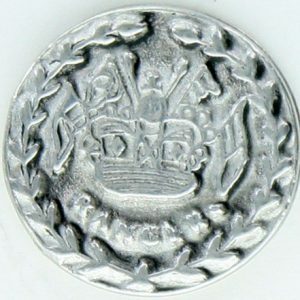 The French Marine button is a domed button with a rim. 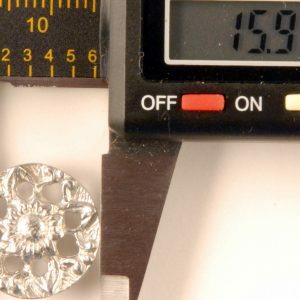 The 208 B is the smallest size at 5/8″. 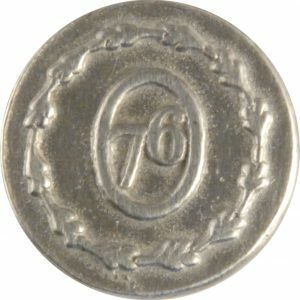 There are two more matching buttons, # 206B and 207 B.
Button #76 S is the smaller in the series of matching pewter buttons with the number 76 on the front. 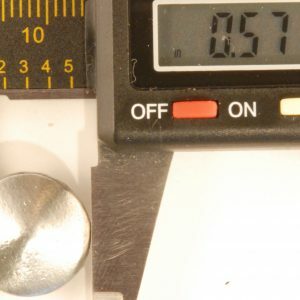 It is 5/8″ in size. These buttons were made for the unit with instructions as to their design. Matches 77 L Special order for gold plating, please call for information as to quantity and price. 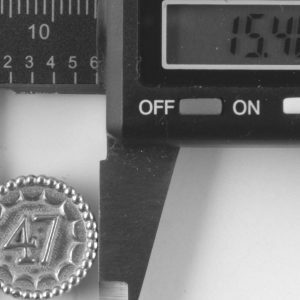 112 S, is the smaller of the two Peaked buttons. Good for Military or Civilian use. 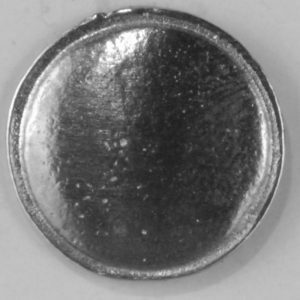 Matching button #113. 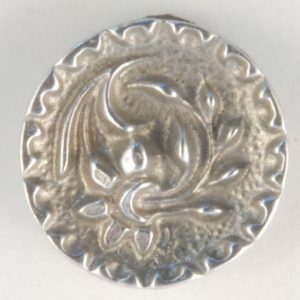 Two sizes for this pretty button. The floral pattern has openings so that what ever color you are wearing it will show through. 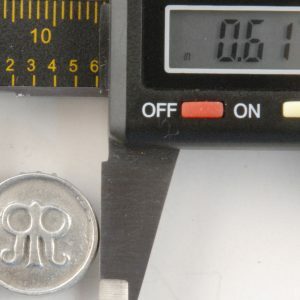 157 is the smaller of the two at only 5/8″. Some have earring made from these. 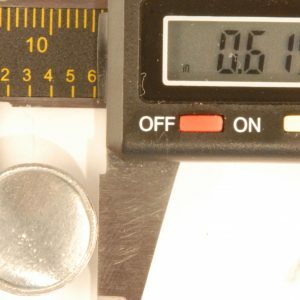 Matching larger button is 158 L.
S is for small, 126 is the button number. 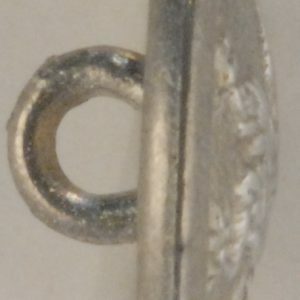 The front is a flat circle, with a loop on the back, The material is Britannia pewter. This button is 1/2″. 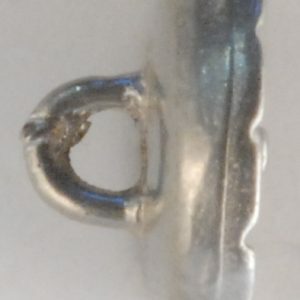 There are 5 buttons like this in different sizes, also a tiny button for shirt collars. 5/8″. 1 to 12 @ .55 each, 13 to 144 @.48 each and over a gross .45 each. 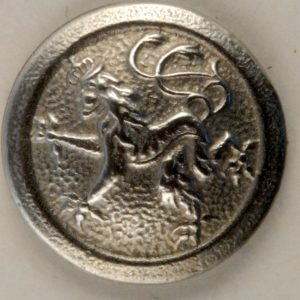 The Rampant Lion is dancing across the button front. It is grand, 169 is round and just 9/16″ in size. 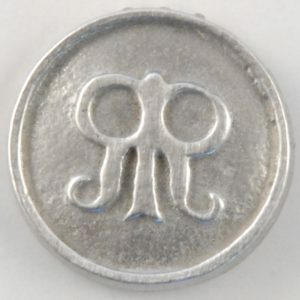 There has not been any found of original buttons from the Roger’s Rangers buttons. This design was suggested by a unit of the re-enactors, which we made for them. 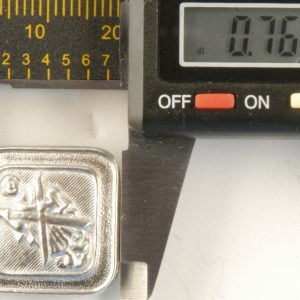 It comes in three sizes, 137 being the smallest size at 5/8″. 1 to 12 @ .55 each, 13 to 144 @.48 each and over a gross .47 each. 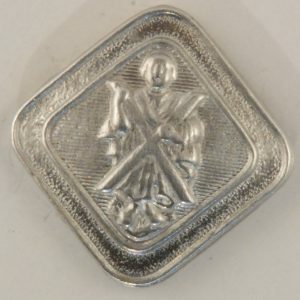 144: St Andrew is a square on the point. 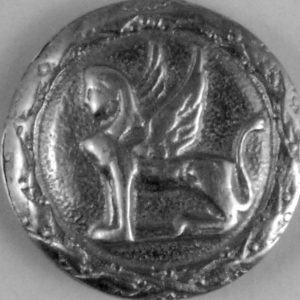 A copy of an old button. 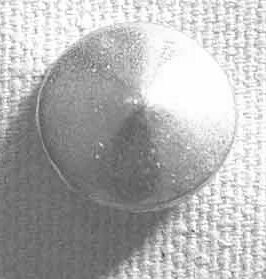 Size is 3/4″ This is a heavy button and up to many tasks.